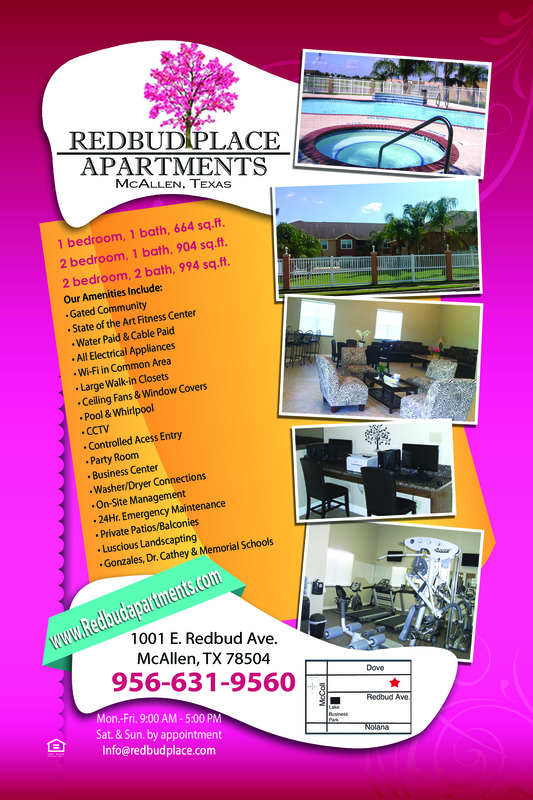 Redbud Place Apartments is located on Redbud Ave in McAllen, Texas. Redbud Place Apartments brings a new rental experience to this vibrant McAllen neighborhood. Our Community offers bright well-appointed Kitchens, spacious Bathrooms, and comfortable living space for all. Redbud Place brings together Quality Living and Convenience to McAllen at a great Price. We have both One and Two Bedroom Apartments Available with leasing options to fit your needs. Click this Link for map and driving directions. Redbud Place offers the convenience of great location with access to all that Mcallen/Edinburg area has to offer for work, play, dining and entertainment. Redbud Place has beautiful facilities that include: Swimming pool, Spa, Business Center,Residents lounge, State of the art fitness center, party rm/ social rm rental and much more . Convenient location only minutes from shopping, dining and weekend entertainment. Local schools are top rated and nearby. Redbud Place can be your home and your getaway from it all. Stop by our leasing office for a full tour and be amazed at all we have to offer. Be a part of one of Americas fastest growing cities and economies …Be a part of our Community. REDBUD PLACE!